Beer dinners, beer sommeliers, cicerones, beer pairings… intelligent concern with good food and beer — both the quality and quantity and attention to pairing flavors — is booming. It sure looks like a trend from where we sit. We’ll be going to a Bruce Paton Beer Chef dinner featuring beers including rarities from Valley Brewing (Stockton) and Schooner’s Grille and Brewery (Antioch) this Friday July 10, partly because we’ve been paying more attention to food and beer lately, and partly because of our appreciation for Steve Altimari and Craig Cauwels, two exceptional brewing talents we last caught up with during their landmark cheese and beer event during SF Beer Week in February. Though we are not particularly “foodies,” we have been paying a lot of attention to beer-food pairings lately. First there was the Cicerone class with Nicole Erny from The Trappist. She’s one of our favorite beer tasting leaders, so when she asked us who might be interested in such a class, we jumped at the chance. Her class covered all of the areas of beer styles, tasting and serving covered by Ray Daniels’ Cicerone program, the serious beer sommelier exam. 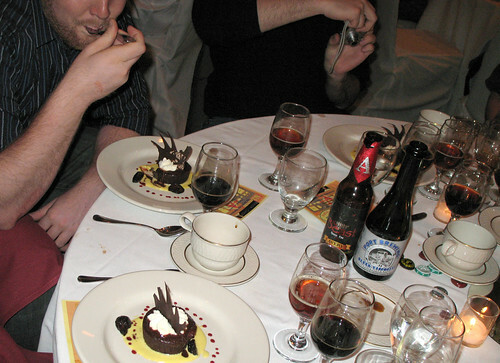 The course just ended with a beer and food pairing exercise in the form of a delicious dinner, each course thoughtfully paired with a complementary beer by a class member. One of the surprise delights was the Urban People’ Common Lager from Linden Street paired with a mixed-fruit tart, with the fresh peaches and berries pulling out sweet golden malt flavors and tangy, minty hops from this new local beer. It was quite an eye-opener, among a whole sequence of delicious pairings which delighted us in different ways. A couple of weeks ago we went to a terrific beer dinner at Millennium, one of SF’s favorite vegetarian restaurants and certainly the one with the best every day beer list, and enjoyed a sumptuous beer pairing evening where the complexity and variety flowed together from one combination to the next. Christmas, Nicole and Jessica are friends of ours, and three of the most enjoyable beer tasting leaders we know, so we had to be there. Happily the meal was incredible, the stories about the beers amazing, and Chef Eric Tucker was charming in his description of how the flavors were matched. For example, the new batch of Russian River Sanctification met up with roasted wild morel mushroom stuffed with white bean sage puree, and a shaved fennel, ripe nectarines, wild arugala and walnut oil salad, calling out the nectarine notes in the complex beer. The guests included Millennium fans who go to many of their special events, beer community people there to see friends and enjoy pairings, and vegetarians interested in craft beers. Interestingly, there was a sizable minority who raised their hands when Christmas asked if there was anyone who’d never tasted a sour beer before. Or is it more noteworthy that the majority had had sour beers? (Russian River beers are sure a fun choice to start the exploration.) It appeared to be a success all around, and we were happy to be there to see friends and meet new fans of some of our favorite beers, as well as to savor the work of a beer-loving chef. Rate Beer Summer Gathering 2009– Dinner and Tour This Weekend!! The wonderfully crowd-sourced beer-evaluation ad trading website “RateBeer” is sponsoring their Summer Gathering this weekend and luckily enough for us it is in the Bay Area. We are attending some of the events and are happily passing the invitation along. You can still sign up (as of Thursday) for tomorrow’s dinner on the Rate Beer site, and you don’t have to be a beer rater there to join in. “The Beer Chef” — Bruce Paton — will be working with some highly appreciated and rated rare beers, making Friday a don’t-miss event. There is limited room to sign up for several of the events of the Rate Beer Summer Gathering, July 11 in San Francisco, including a particularly inexpensive bus tour of favorite Sonoma county destinations. It’s one of those extended virtual beer community holidays that offers a chance to meet people who know and care about fine beer, as they learn about the Bay Area beer community. And about our great food town, too. P.S. We didn’t list Drakes (The Saturday night Grand Tasting’s location) as a BARTable destination — it’s more than a mile from the San Leandro Station — but here’s how you’d walk (by daylight please) Get info at 510-562-0866. Sometimes there are Friday afternoon open house hours, currently on hiatus. Good seeing you at the Bistro’s barrel-aged event a couple of weeks ago. Indeed, I did try e-mailing you right afterward (as I said I would) but the e-mail bounced back. In any case, you should now have my e-mail address if this goes through. Since I am here, my birthday is coming up soon and last year my wife took me, upon demand, to the wonderful beer dinner hosted by Chenery Park in S.F. in conjunction with Russian River. I looked for another such event locally this year and found nothing. I do like good beer dinners. Is it possible you might want to expand to provide a clearing house for that service as I could find nothing convenient on the web in that vein? I should think both restaurants and beer geeks would be grateful. And, of course, there is the added bonus to me of knowing that I volunteered somebody else to do more work than they are already.